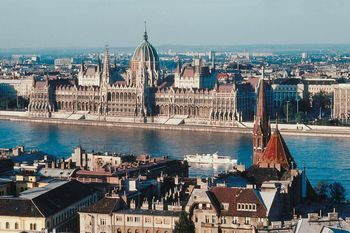 Hungary’s vibrant capital Budapest has emerged as the best value destination for Brits who are attempting to make their pounds stretch further. Research by Post Office Travel Money revealed that the out of 25 destinations across Europe and the US, Budapest offered the lowest total cost for twelve typical city break items, at just £134.76.This is a staggering £406.47 cheaper than the bill that British holidaymakers would have to foot in the Big Apple (£541.23). The items listed in the survey included the cost of 2 night’s 3-star city centre accommodation for two, a three-course evening meal for two with a bottle of wine and a sightseeing city bud tour. The top five ranking of the cheapest destinations was completed by Vilnius, Lithuania (£140.99), Warsaw, Poland (£151.69), Riga, Latvia (£155.34) and Lisbon, Portugal (£166.43). The most expensive cities in Europe were the Danish capital Copenhagen, where total costs climbed to £440.45, followed by Sweden’s capital Stockholm (£420.36). The falling value of the pound against major currencies in recent weeks has mean that year-on-year holiday costs for Brits have risen in 22 of the 25 cities included in the research. However, holiday costs for UK travellers have fallen in locations including Berlin (down 1.5%), Prague (down 6.8%) and Lisbon (down 19.1%). Andrew Brown of Post Office Travel Money said: “Rising prices in most of the cities we surveyed, combined with the falling value of sterling, make it more important than ever to check prices for key items like meals, drinks and sightseeing before booking as these are costs that most city break tourists cannot avoid. “There are big price variations across Europe - not just in the eurozone. “This means UK holidaymakers can make their pounds stretch further by choosing a cheaper capital like Lisbon or Budapest.” If you are heading off on holiday in 2013, it is important to secure travel insurance whichever destination you are travelling to.